The Junior Double Panel Climbing Wall features two panels, one set lower, to help little ones progress easier to a more challenging height. A great addition to preschool playgrounds, daycare centers, and parks. Rounded hand and foot placement cutouts allow children to practice their climbing skills safely while improving their hand/eye coordination and fostering confidence. 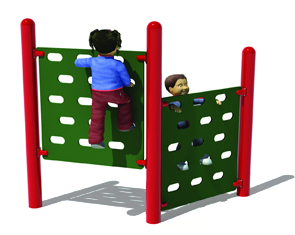 Kids can climb up and down or side to side as they master the five foot tall climber. Manufactured for commercial use and tested in accordance with ASTM standards. The climbing wall is constructed of two 3/4" high-strength polyethylene plastic climbing panels supported by your choice of three 3-1/2" Dia. or 5" Dia. steel posts. 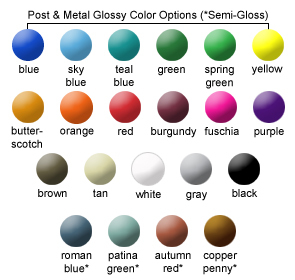 The galvanized steel posts are powder-coated with a triple flo-coated corrosion protection for a superior, high gloss, no peel, no flake finish. Panel and post color options shown below.